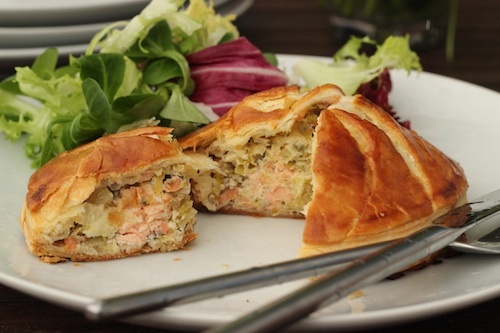 Alchemy in the Kitchen: Fresh and Smoked Salmon & Leek Pithiviers – a posh word for pie! Pithivier - a posh word for pie! A self-catering break can be a real challenge for a cook. Blunt knives and bockety pans are par for the course on a hired narrow boat, canal barge or holiday cottage and the kid behind the counter of the local corner shop will look at you oddly if you ask for anything out of the ordinary… pesto for instance. Funnily enough, rather than putting me off cooking, the quest to produce something delicious using the simplest of ingredients, the most basic of tools, and a minimum of effort shakes me out of a rut. It reminds me to cook the style of food that is close to my heart - easy, quick and tasty. 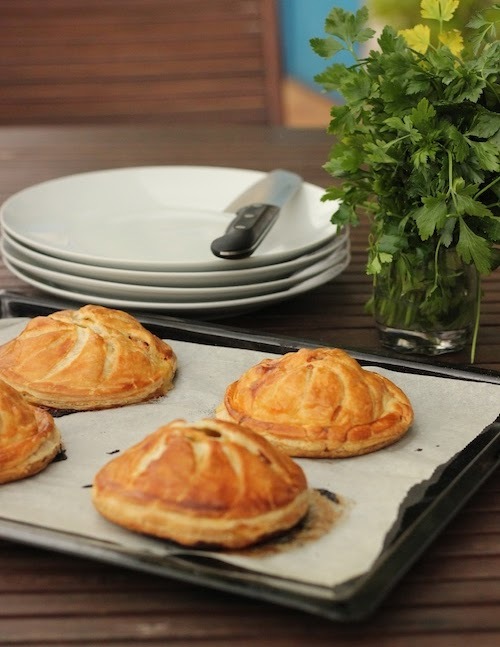 Pithiviers fit the bill – a Pithivier is a posh word for a little puff pastry pie, filled with a sweet or savoury filling. I’ve gone for a fresh and smoked salmon and leek filling. They are perfect for lunch or dinner, hot or cold, and a delight on a picnic. Here I have used ready-prepared puff pastry. If you have the will and wherewithal to rustle up perfect puff pastry from scratch in self-catering, you are a better person than I am. First melt the butter over a medium heat in a large frying pan. Add the shredded leeks and stir until coated in the melted butter. Reduce the heat, cover with a lid and cook gently without colouring for about 10 minutes. Remove from the heat and set aside to cool while you prepare the rest of the ingredients. Put the mascarpone, and the lemon juice and zest in a large mixing bowl and give it a quick whisk with a fork. Mix in the rest of the filling ingredients (including the leeks once they are completely cool) until coated in the mascarpone. Cover and refrigerate until needed. 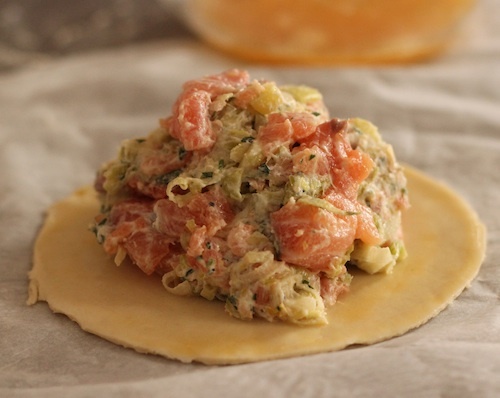 Divide the salmon mixture into 4 even portions and pile a portion in the centre of each of the smaller pastry circles, leaving a margin of about 2cm all the way around. Brush each margin with a little of the beaten egg. 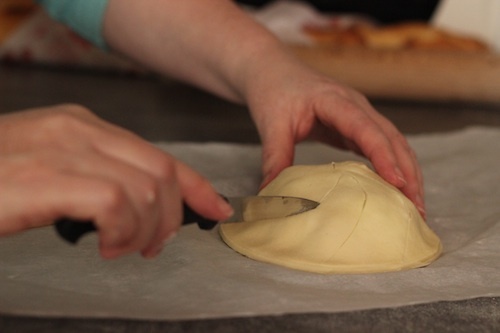 Cover each with a large pastry circle, pressing around the edges to ensure a good seal. Trim away any excess overlapping pastry to leave a neat edge. 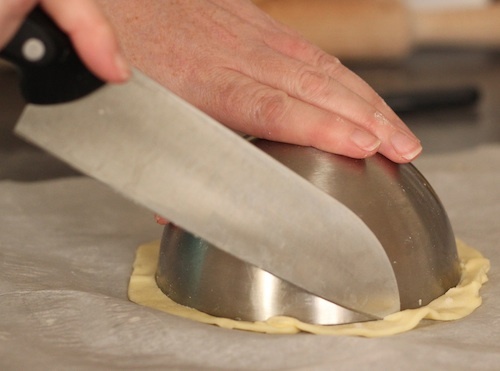 Using a small sharp knife make a small hole in the centre of each pie to let steam escape while they cook. It is traditional to score the surface of each pie with semi-circular lines radiating out from the centre. Refrigerate the Pithiviers until needed. When you are ready to bake, pre-heat the oven to 180°C (fan). Place the pies on a non-stick baking tray or one lined with baking paper and brush with beaten egg before baking in the pre-heated oven for about 25-30 minutes or until risen and golden. What gorgeous pastries! 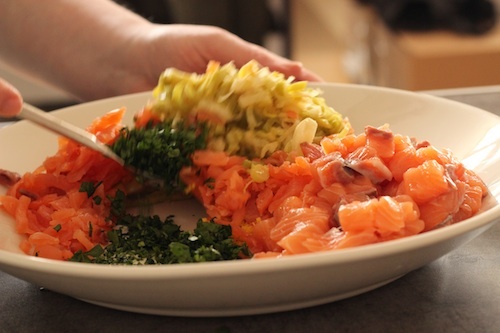 I love salmon filling. That salmon looks incredible and who can resist puff pastry! I didn't know you'd written a cookbook. I'll have to take a peek!